FRIDAY EVENING, AUGUST 21, 2015. 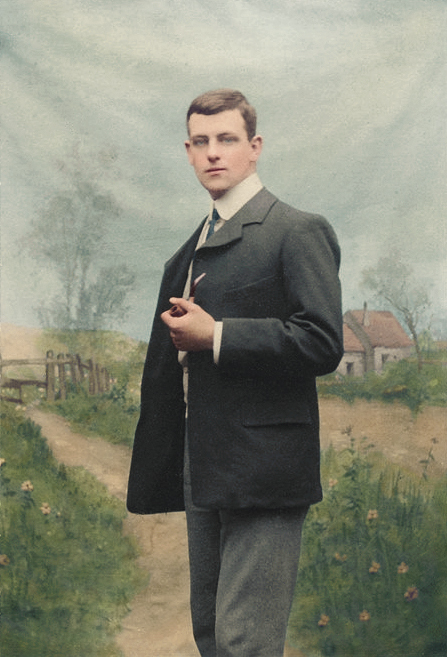 The front covers feature a photograph of 21-year-old P. G. Wodehouse that was originally published in the September 1903 issue of The Captain. The photo has been restored and colorized by Laiz Kuczynski. 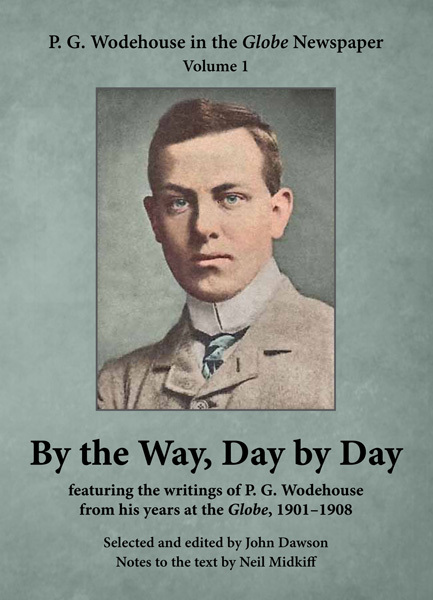 The P. G. Wodehouse Globe Reclamation Project announces the publication of P. G. Wodehouse in the Globe Newspaper, 1901–1908, Volumes 1 and 2. The books are the first results of a three-year effort by an international group of Wodehouse scholars to obtain and study Wodehouse’s daily “By the Way” columns, found to have contained thousands of short paragraphs and verses attributable to him. Unseen for over 100 years and scanned from microfilm in London and Los Angeles, the columns not only shed new light on an important, formative period of his career, but also many display “the brilliant craftsmanship and wit for which P. G. Wodehouse has always been known,” according to GRP founding member John Dawson. 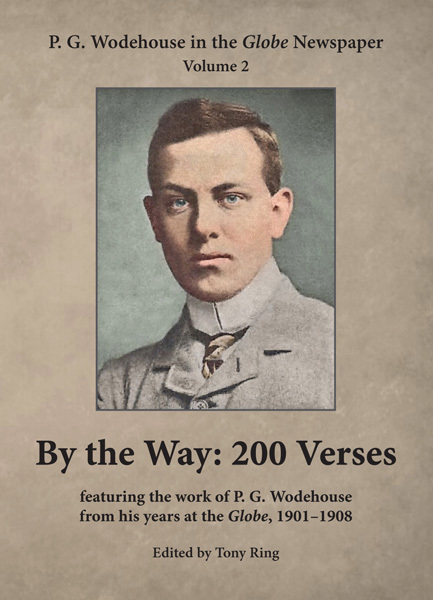 Volume Two, By the Way: 200 Verses, features a sparkling trove of poems attributed to Wodehouse by an international panel of authors and experts. Edited by Tony Ring, the world’s leading authority on Wodehouse’s lyrics and poetry, the hilarious poems showcase his genius with the verse form, evident even in his early years. Ring’s commentary and learned notes provide the Edwardian perspective and bring the verses to life once again. In a remarkable introduction, Ring describes the intricate protocol used by the GRP’s five-member Poetry Review Panel to attribute the unsigned poems. By the Way: 200 Verses represents, by far, the largest body of Wodehouse’s delightful and innovative poetry ever to have been found. Ordering: Priced at US$50 the set, the books can be ordered directly from Seattle Book Company (the distribution arm of our printers), and through Amazon.com. As of 27 September 2015, Amazon.com is now allowing international orders at reasonable shipping rates; Amazon.co.uk is not yet listing the books. Members of the USA and UK Wodehouse Societies will receive special promotional codes through their society journals for a 20% discount from the list price (discount only valid at Seattle Book Company). P. G. Wodehouse (1881–1975) is widely regarded as the foremost comic novelist of the twentieth century. His dozens of novels of Jeeves and Bertie Wooster, the lovable, dotty Clarence, Earl of Emsworth, and a hilarious host of others have garnered millions of fans over the world and remain in print today. An acknowledged master of the short story as well, his 30 tales of love-struck golfers, as told by “The Oldest Member,” are considered by many to be the best examples of golf fiction ever written. Also widely known for his Broadway musical theater collaborations with Jerome Kern, Wodehouse wrote literate song lyrics that were praised by Ira Gershwin, Richard Rodgers, and many others. The Kern/Wodehouse shows Miss Springtime (1916), Leave It to Jane (1917), Oh, Boy! (1917–18) and Oh, Lady! Lady!! (1918) are considered to have revolutionized musical comedy, in no small part due to Wodehouse’s intelligent, witty lyrics. In addition to some 100 books and more than 300 show lyrics published during his lifetime, in his days as a journalist Wodehouse wrote for London publications such as Punch, The Strand Magazine, and a variety of papers and magazines. During the period covered by the two P. G. Wodehouse in the Globe Newspaper books, Wodehouse wrote and published his first books: The Pothunters (1902), A Prefect’s Uncle (1903), Tales of St. Austin’s (1903), The Gold Bat (1904), The Head of Kay’s (1905), The White Feather (1907), Love Among the Chickens (1906), Not George Washington (1907), and The Globe By the Way Book (1908), as well as nearly 500 articles, stories and poems.